Contains premium organic and wild-crafted: Orange, Lemon, Grapefruit, Nutmeg, Anise Seed, and Clove Bud essential oils. Harvest™ blend brings the feelings of fall year round. Specifically formulated to have an aroma that naturally elevates mood and creates a feeling of grounding while invigorating, stimulating, empowering, and uplifting the spirit. 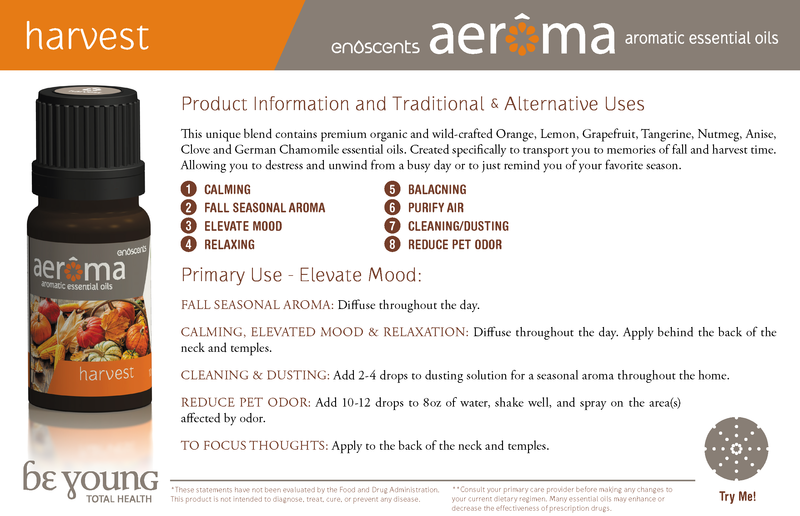 Additionally, grapefruit and German chamomile essential oils has shown promising properties against anxiety. Harvest™ is a perfect companion for those days that don’t work out as planned. Apply 2-3 drops to your hairline and temples. Apply 1-2 drops to the big toe to help multiple sclerosis victims focus.